Great news! 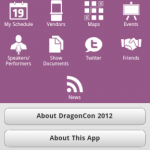 The Dragon Con 2013 mobile app is here! 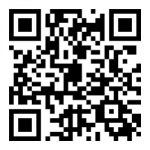 Scan the QR Code with your mobile device to download or go to https://m.core-apps.com/dragoncon13. Please note that the schedule information is NOT complete. It is still being updated. Because folks can’t be in multiple places at one time or always get to the most popular events at Dragon*Con, we live broadcast as well as video record some events for later showing on Dragon*Con TV. Check out the full 2012 DCTV broadcast schedule (link opens a Google Docs spreadsheet). 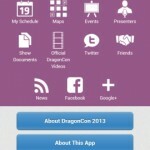 You can also access the DCTV broadcast schedule as a PDF in Show Documents of the mobile app. Hear ye, hear ye! The Sheraton Information Booth is located on the 1st Floor. In the mobile app, the 3rd Floor Sheraton Map is also showing an Information Booth, but it’s wrong. If you need Dragon*Con information at the Sheraton, go to the 1st Floor, not the 3rd Floor. That is all.